Keeping your children safe while they are in the car is very important. They are too small to be strapped securely into the seats of your car, which means they need to use their own car seat. 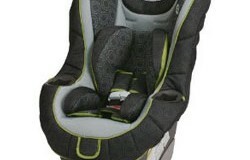 These car seats can be strapped in using your cars standard seat belt and then the child can be secured into this seat. Britax is a very respected name producing a wide range of products for babies and young children. This range includes pushchairs and notably car seats. The Britax Roundabout 55 Convertible car seat is one of the most popular seats currently available. This car seat is designed for use by babies from birth and can be used either facing or against the direction of travel. Babies from 5 pounds should be secured with the car seat facing backwards. Older children up to 55 pounds can face forwards which makes it easier to entertain them and keep them happy while in the car. Because this car seat is convertible you shouldn’t need to buy another car seat, the next you will need is simply a booster seat until your child is big enough to sit in the car without a seat. 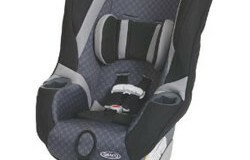 The Britax Roundabout 55 Convertible Car seat offers many safety and comfort features. The seat is filled with lots of comfortable foam and has high sides to protect an infant in case of a collision. 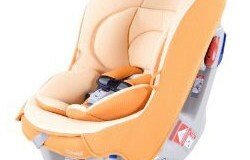 Safe cell construction techniques also allow the seat to absorb forces of an impact and protect the child’s head as much as possible. While safety may be of paramount importance when choosing a car seat, the comfort should not be overlooked. Having a comfortable baby in a car seat will make journeys much more pleasant as nobody enjoys driving while their baby is testing their lung capacity at full volume! SafeCell Technology – Works in a similar way to crumple zones in a car, areas designed to compress to absorb impacts and protect the infant. Anti Slip base grips onto the vehicles seat without causing damage, further improving the safety of the car seat. With so many car seats on the market you might feel lost and confused. However, you certainly can’t go wrong with the Britax Roundabout 55 Convertible car seat. This is built to last and will be suitable for many years to come. As it suits children from birth until they are 55 pounds, you can get a lot of use out of it. The car seat is very secure and will protect your child in case of an accident. It also ensures that they are comfortable which improves the chances of them going to sleep and you having a more peaceful journey. Summary : Labels are poorly rated by NHTSA otherwise this is a good product on other parameters.